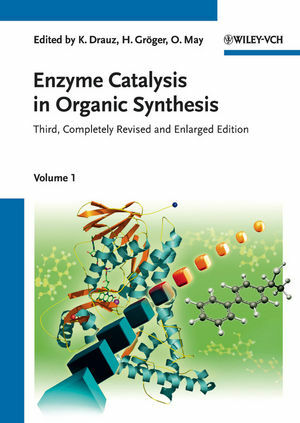 This comprehensive three-volume set is the standard reference in the field of organic synthesis, catalysis and biocatalysis. Edited by a highly experienced and highly knowledgeable team with a tremendous amount of experience in this field and its applications, this edition retains the successful concept of past editions, while the contents are very much focused on new developments in the field. All the techniques described are directly transferable from the lab to the industrial scale, making for a very application-oriented approach. A must for all chemists and biotechnologists. Karlheiz Drauz is Vice President International Scientific Relations of Evonik. He evaluates interesting topics in research and development and networks globally with academic and industrial institutions. He did his Ph.D. at the Technical University Stuttgart, Germany, and started his career at Degussa 1980 in various positions in research and development. Amoungst his research interests are amino acids, peptides, biological active compounds, asymmetric synthesis, metal and biocatalysis as well as process chemistry. He holds about 160 patents, about 100 scientific publications. Since 1992 he is honorary professor for organic chemistry at the University Würzburg, Germany. Harald Gröger is since 2006 Professor for organic chemistry at the University of Erlangen-Nürnberg, Germany. He studied chemistry at the Universities of Erlangen-Nürnberg and Oldenburg, before he did his postdoc with Masakatsu Shibasaki at the University of Tokyo. He worked from 1998 to 2006 in industry, e.g. as senior project manager for White Biotechnology of Degussa. He received several awards, like the Degussa innovation prize for new products (2003) and for new and optimized processes (2005), the Thieme award in 2007 and the German business sectors innovation prize (2004). His research interests are enzyme catalyzed organic synthesis, design and use of biomimetic chemocatalysts as well as sustainable chemistry. Oliver May is Competence Manager Biocatalysis and responsible for coordinating biocatalysis related activities of DSM Pharmaceutical Products. Before joining DSM in April 2006, he was with Degussa (now Evonik) in various functions; latest as General Manager of Degussa's Service Center Biocatalysis. He was educated in Germany, receiving a PhD degree in Technical Biology from the University of Stuttgart where he worked at the Institute of Biochemical Engineering for Prof. C. Syldatk and at the German Center for Biotechnology in Braunschweig with Prof. D. Schomburg. He joined Caltech as a postdoc in 1998 where he worked until 2000 in the group of Prof. F.H. Arnold on directed evolution of enzymes. Oliver May has authored more than 30 scientific contributions in Journals and Books and more than 15 patent applications. He his team was awarded several innovation awards on hydantoinase technology, whole-cell processes and the latest on recombinant pig liver esterase in its application for production of a pharma intermediate.